Choosing which style guide to use depends on your needs. If you need to cite a wide variety of sources and material types you probably need a very detailed guide. In this case the official manual for the style is your best bet. NOTE: Most citation styles require that you cite the same or similar elements for each material type, but differ on things like the order and layout in which the elements appear. So, while the details may be different, the basic pieces of information you'll need to cite will often be the same. Style guides will help you navigate these differences. If you just need a quick refresher on how to format something in a style you've used before, an online guide or tip-sheet might be best. If you've never used a style guide before it can be confusing to navigate. The index may be the easiest way to get to the page you need to consult, but first you need to analyze your source and determine which citation elements you'll need to record. 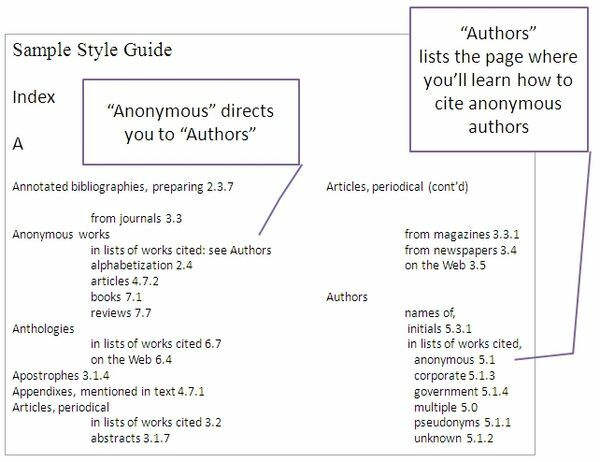 Finding the rules for citing different types of sources works the same way as finding out how to cite different types of authors - consult the index. Make sure that you look up the rules for formatting your citation both in the text of your paper and in the list of works cited/bibliography.